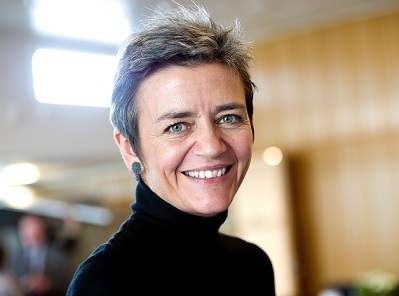 Despite taking a tough line on some of the world’s largest companies – or maybe because of it – Competition Commissioner Margrethe Vestager still has some friends in Europe. The Dane is often credited as being the EU’s most popular commissioner, but the question is what she will do when her period of office expires at the end of October this year. Vestager’s party Radikale belongs to a grouping called the Alliance of Liberals and Democrats for Europe (ALDE) and, unlike many other European groups, it doesn’t go in for the idea of preferred candidates. But there is speculation she could rise even higher. The current European Commission president, Jean-Claude Juncker, will step down after the upcoming European elections and Vestager could be in the running to replace him. “She’s highly respected, serious, visible, active and a very strong card for ALDE. Personally, I think she would be an excellent president for the commission,” Rem Korteweg, a senior researcher at the Dutch Institute for International Relations, told DR Nyheder. He also went on to say that she may face competition from the Dutch PM Mark Rutte, who is also a member of the ALDE group.